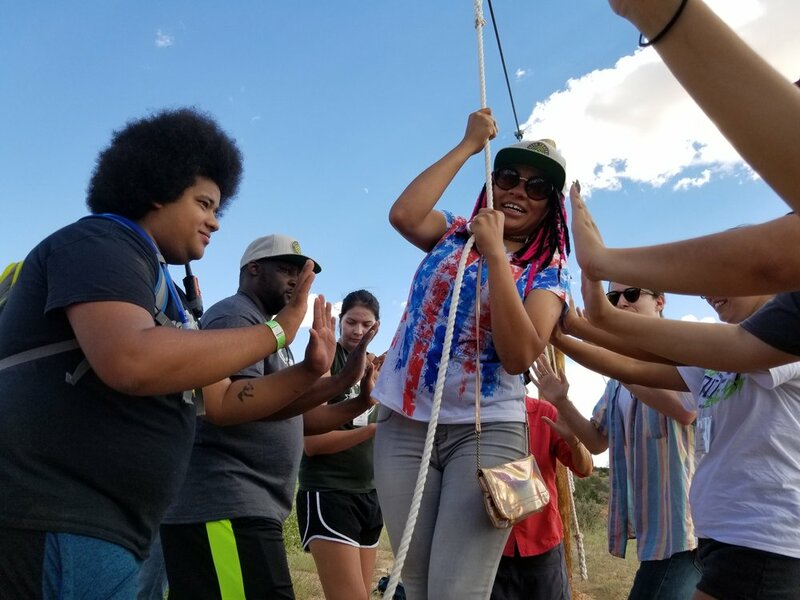 Day two of the Fresh Tracks training at Ghost Ranch began with a morning hike to Chimney Rock and ended with a celebration of culture and community around a campfire. The time in between was a shared journey to leadership marked by words of wisdom, self discovery, laughter, reflection, and joy. In the morning session, Kristen Ragain, Philanthropy & Community Partnerships Manager at REI, saluted the Fresh Tracks participants for “using the outdoors as a platform to learn about yourselves and to create change” and talked about the work REI is doing nationally to build more on-ramps to the outdoors for all people. Her closing note included three pieces of advice: Take care of yourselves. Take care of each other. And get outside as much as you can. Thank you to Kristen for spending the weekend with us in New Mexico and to REI for being a generous, long-time supporter of Fresh Tracks. After working to develop their personal narratives and understand their “Leadership IQs”, Fresh Tracks moved to the low ropes course, where participants worked together on a series of challenges requiring teamwork, communication, patience, and humor. Debriefs after each challenge highlighted the connection between the morning workshops and the ropes course as the groups recognized how a blend of different leaderships styles is essential to group success - how drivers, relationship masters, architects, and motivators all play a role. As night fell and the stars peeked through the light clouds, Fresh Tracks hiked up the hill to a campfire, still energized from the Implicit Bias workshop led by Dr. Sharoni Little of the Strategist Company and the USC Marshall School of Business (and Fresh Tracks’ Evaluator). Around the fire, participants shared stories, poems, games, and heirlooms passed through generations, each carrying a powerful story of tradition, reverence, and connection to the land. The only thing with the power to follow an experience like that around a fire - s’mores. Check back soon for a report on Day 3!